Can San Andreas handle the pressure? It's time for the next phase of GTA 5 madness, with Rockstar's ambitious Grand Theft Auto Online open for business starting today. Rockstar said it expects the update to hit the UK at 12pm UK time. Right now we're hearing that people in the US are finding that the update has already gone live, so keep your eyes peeled. 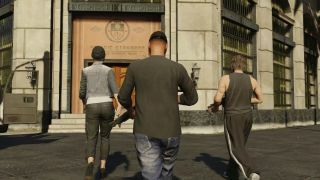 GTA Online lets you take to the San Andreas with up to 15 other people, with a vast collection of missions and jobs to carry out, properties to buy and places to explore. The update weighs 59 MB and can be downloaded on either Xbox Live or the PlayStation Network. Once GTA Online is unlocked, you'll be able to jump in by selecting the bottom slot on the game's character wheel. The question is: will the game be able to cope with today's demand? Rockstar recently said it was buying up more servers in anticipation of the big launch. Though it warned that it's likely the first few days would be "more temperamental than such things usually are". There have already been some problems experienced with some Social Club services and the iFruit App. Of course, we expect Rockstar will have all this balanced out pretty quickly, so switch your console on, tell your friends to get ready, and start refreshing Xbox Live/PSN until the update appears.